Disabled Online Personals is for disabled singles looking for romance, either with others who are disabled, or with admirers. Niche dating has exploded online, providing sites that are exclusively focused on one particular group of people (and the people who are interested in that group). If you are interested in the Disabled community, Disabled Dating Connexion is the site for you. It only takes minutes to create a free account, and then you are free to check out the singles who have also been drawn to this site. You can't meet someone just by looking at the homepage, so join...and start having fun! While there are individuals with disabilities on just about every dating site, there is something to be said for a site dedicated to connecting disabled singles. 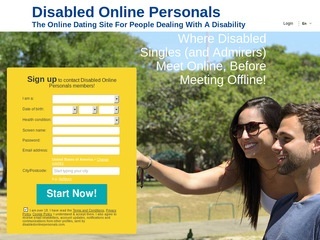 If you are dealing with a disability, or you are interested in individuals regardless of whether or not they are dealing with a disability, Meet Disabled Singles is the site for you. Join for free and start meeting fun singles today. HFriends.com is dedicated to becoming the number one site on the internet for people with disabilities (PWD). Dateable was founded in 1987 to combat the isolation and social discrimination often experienced by people with disabilities. Dateable is a non-profit social organization that welcomes those with and without disabilities. "Outsiders is for people who feel isolated because of socially and physical disabilities. The club helps them gain confidence, make new friends and find partners. We welcome people of all sexualities, whether they are single, divorced, separated or married, and we discriminate against no one. Our members appreciate a club where disability is accepted and people can relax and be themselves. The first step may be to acknowledge the person's sexuality, and offer support in asserting their right to a private life, and seeking love in a society where status normally stems from good looks and money." 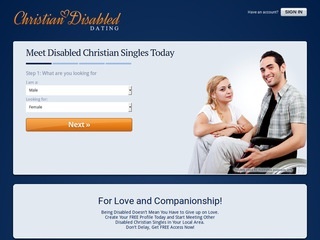 "German dating site for the disabled." "Disabled dating is difficult you say? Hard to find like - minded individuals who would understand your special needs? With absolutely free disabled dating opportunities now open to you, the world is waiting to be explored." A social networking community site that describes itself as "a network of people living with the dangerous gifts that are commonly labeled as bipolar or related 'mental illness.'" Care Flash is an invitation only social network for individuals to share information regarding their health condition, or that of a loved one. The site is unique in that it incorporates flash movies, and 3D animation of various health issues to make it easier for people to understand what other members are dealing with. It's ability, not disability that counts! HUGE national resource site with community involvement and economic participation information for people with disabilities.